Barack Obama revealed his new plan to an arena in Canada yesterday. The former president told the crowd “if we can train a million Baracks and Michelles” then he could see his goals for America realized. For the first time since he left office, the 57-year-old gave a detailed account of how he will lead the country to “recover” from the last two years with his army of Baracks and Michelles. Well, he was just made to regret it. Barack Obama, promoting the non-profit foundation that bears his name, suggested the need to “train a million Baracks and Michelles” to instill hope in these troubling times in America. Although the “anointed one” refrained from naming President Donald Trump, everyone in attendance understood the former president was referencing the last two years since Trump took office. Speaking to a sold-out arena in Winnipeg, Canada, the former president insisted that these “challenging times” can be met with “skills, support, financing” and an army of community organizers, the Washington Examiner reports. Talk about your all-time entries for the Hall of Fame of bad ideas. One Barack and Michelle nearly took down the country and led to the rise of a successor that actually cares about America. Most Americans will take a hard pass on this brilliant plan. But the 44th president wasn’t done. “If we train them — if we give them skills, support, financing, media training, spotlights, then they’re the ones that are going to carry forward the solutions that we so desperately need,” Obama added. Well, most people would say that someone who wanted to duplicate millions of themselves to save the world suffers from a God complex. In the very least, Barack reminds us of Dr. Evil who was hellbent on taking over the world. Oh, and this isn’t a new concept for the Obamas. The former first couple are known narcissists, and they have said this time and time again. Obama, speaking of his foundation in March of 2018, unleashed the idea to his supporters,” the Political Insider reports. Then, Obama took a shot at the current administration without naming names. The man who held back the American economy, jobs, and businesses claimed the current White House wouldn’t be able to handle an economic crisis in a “common sense” manner. Americans made it clear that Barack’s off his rocker and that this plan will be rejected by all sane people worldwide. “ARE YOU KIDDING? THE OBAMAS HAVE SCREWED THE AMERICAN PEOPLE FOR THEIR RICH PERSONAL GAIN! LOOK UP THERE HISTORY AND STOP BEING NAIVE! Obama: There’s hope ‘if we can train a million Baracks and Michelles,’” tweeted Julie McDowell. Can you imagine anything more frightening than a world of Obamas? There are so many Americans sounding off on social media. Barack and Michelle’s Twitter feed must be blowing up. The former president took his act up to Canada hoping to test the waters before he launches it back here in America. Well, let’s make sure the former first couple get the message loud and clear. 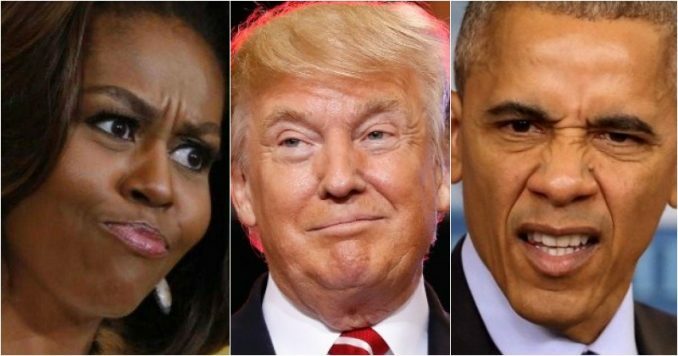 Americans couldn’t wait for his term to end, and we voted for President Trump which was a total rejection of everything the Obamas stood for, and the last thing we need is a million Baracks and Michelles running around.